This Article considers the significant state court reform developments in the year following the Supreme Court’s landmark decision in Caperton v. A.T. Massey Coal Co., as well as ancillary federal developments, including renewed congressional interest in judicial disqualification. Picking up on the author’s view that “paradoxically for a decision overturning a state justice’s non-recusal, the majority’s approach is a model of cooperative federalism,” the Article focuses primarily on the initial developments pertaining to money in the courts in Wisconsin, Michigan, and West Virginia in the short period since the decision. The Article notes that while recusal practices have certainly been one focal point of developments in the states, Caperton has also provided a significant boost to judicial public financing. After considering tangible developments in the three identified states, the Article briefly points to more nascent judicial independence efforts in other states, in which Caperton connections are less direct, but where the case is nonetheless figuring prominently in rejuvenated efforts to modify judicial selection practices. The Article asserts that, while not all of the post-Caperton developments have improved the judicial impartiality landscape, on balance, the decision is already producing meaningful improvements in protecting the courts from the influence of money. James J. Sample, Court Reform Enters the Post-Caperton Era, 58 Drake L. Rev. 787 (2010). Featured in Syracuse Law Review’s Caperton Symposium (which, by the way, contains several other good reads), Professor Sample’s second article makes the provocative claim, among others, that Caperton is a model of federalism. James J. Sample, Caperton: Correct Today, Compelling Tomorrow, 60 Syracuse L. Rev. 293 (2010). In this Article, I take the most extensive look to date at pro-prosecution judges and ultimately advance the following, slightly scandalous claim: Particularly in our post-Caperton, political-realist world, “tough on crime” elective judges should recuse themselves from all criminal cases. The contextual parts to this claim are, in the main, a threefold description: (i) the “groundbreaking” Caperton v. A.T. Massey Coal decision, its predecessors, and its progeny; (ii) the judicial ethics of disqualification; and (iii) empirical and anecdotal evidence of pro-prosecution (commonly called “tough on crime”) campaigns and attendant electoral pressures. Building on this description and the work of empiricists, we bridge the gap between these tough-on-crime campaign promises and subsequent tough-on-crime adjudications. And in the final analysis, the thesis — namely, that tough-on-crime judges should recuse themselves in most, and probably all, criminal cases in light of personal and systemic biases — is corroborated not just by Supreme Court reasoning and language, but even more importantly (at least from my perspective as an ethics professor), by the rules of judicial ethics. Thus, pro-prosecution judges and their not-too-sophisticated message — “me tough on crime, you soft on crime” — should cease and desist or be ceased and desisted. Parts. Part I briefly describes elective judicial selection systems and thoroughly describes “tough-on-crime” judges, their messages, and their motivations. Part II, the core of the analysis, runs tough-on-crime judges through the constitutional, ethical, and other-legal frameworks of disqualification. All of these frameworks — some four or five different legal and ethical barriers, depending on one’s jurisprudential view — ultimately lead to the same place, mandatory disqualification. Part III critically appraises elective systems, the theoretical and economical costs that those systems impose on judges and litigants, and the alternatives, including broadly or narrowly targeted disqualification, public financing, and forced silence. By the Conclusion, the analysis has pointed strongly toward a broad-based, mandatory-disqualification remedy. Keith Swisher, Pro-Prosecution Judges: “Tough on Crime,” Soft on Strategy, Ripe for Disqualification, 52 Ariz. L. Rev. (forthcoming 2010). A link to which can also be found in Articles. The Wisconsin Supreme Court recently became the first state court to take post-Caperton, rule-based action. (Michigan recently became the second; for more information, click here.) Putting the merits to the side — ignoring them altogether, actually — the Wisconsin Supreme Court should be commended for taking expeditious action following the Supreme Court’s groundbreaking Caperton decision. The praise ends there, unfortunately. In a puzzling, recalcitrant move, the court adopted two rule amendments that appear to ignore both Caperton and its interpretation of the Due Process Clause. Combining the amendments, they essentially state that contributions or expenditures — from any source and irrespective of amount — to elective judges in Wisconsin do not alone warrant recusal/disqualification. That is not a brief restatement, but rather, a nearly exhaustive statement of the amendments (to verify, click here and here for the full text of the adopted amendments). A state supreme court rule purporting to limit the reach of Caperton and constitutional due process seems anomalous; how such amendments are anything but scoffing and heel-digging remains to be explained. Interestingly, the vote of the court was a deep split of 4-3, with Justice Gableman in the majority. One point of caution, at this early stage, is that we are reading from mere tealeaves. The Wisconsin Supreme Court has not as yet published its orders or issued a press release. One can hope that the court will explicate in what ways, if any, these amendments constitute learned contributions to the law of disqualification. 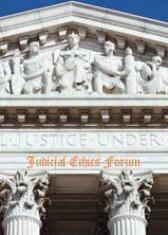 The Drake Law Review and the American Judicature Society are pleased to announce the Seventh Annual American Judicature Society-Drake Law Review Symposium Issue: The State of Recusal: Judicial Disqualification, Due Process, and the Public’s Post-Caperton Perception of the Integrity of the Justice System. • The effect of judicial disqualification on the popular legitimacy of the judicial system. As we predicted, the Supreme Court has voted five to four in general favor of the Due Process Clause and disfavor of judicial electioneering. Justice Kennedy authored the opinion concluding that Justice Benjamin harbored a serious, objective “probability of bias” when he refused to recuse himself in a case involving his biggest supporter from his previous — and perhaps future — election. Justice Benjamin also chose the two replacement jurists for the two justices who did recuse themselves from the case. Interestingly, the dissenters argued that the decision will create an increase, if not a flood, in “Caperton claim[s].” Assuming those claims are meritorious — and judicial elections do provide fertile grounds for such claims — we should thank this watershed decision and welcome the flood. The full text of the opinion, as well as the dissents of Chief Justice Roberts and Justice Scalia, can be found here. In Caperton, Chief Justice Roberts dismissed the majority’s “probability of bias” test, calling it a “cure . . . worse than the disease.” He believes that the “Court’s new ‘rule’ provides no guidance to judges and litigants about when recusal will be constitutionally required,” which “will inevitably lead to an increase in allegations that judges are biased, however groundless those charges may be,” which in the end, “will do far more to erode public confidence in judicial impartiality than an isolated failure to recuse in a particular case.” His consequence connector seems miscalibrated. It is exceedingly odd to claim that remedying this “extreme case” — one in which every justice, and the polled public, seem to agree bruises the perception of impartiality — will “erode public confidence in judicial impartiality.” As an umpire who merely calls balls and strikes, perhaps the Chief Justice needs to get back in the game and out of the policy incubator. His dissent is notable, but not because of these loose causal connections involving hypothetical challenges, but because it has attracted significant attention through the casting of forty questions — forty questions that the majority’s analysis allegedly cannot answer. While some commentators have hailed the questions as an indication of infirmities in the majority’s analysis (e.g., “bad facts make bad law”), I respectfully dissent from the dissent; every question, save one or two, can be answered (and the ones that cannot seem to reflect more poorly on the questioner’s drafting than the majority’s analysis). As a preliminary matter, I note again that an umpire who merely calls balls and strikes should be less concerned with questions not before the court, and indeed, every case could spawn a multitude of forward-looking questions not raised by the facts at hand, but let’s play the game these objections notwithstanding. Proposed answers are in bold following the applicable questions. 3. Are independent, non-coordinated expenditures treated the same as direct contributions to a candidate’s campaign? No, the latter support is worse—the influence is more direct. What about contributions to independent outside groups supporting a candidate? The question must be initially answered with a question: What “independent outside groups”? But as general matter, yes, that the contributions were to some “independent outside groups” should be considered and could in the abstract be mitigating. 4. Does it matter whether the litigant has contributed to other candidates or made large expenditures in connection with other elections? Probably not (unless the other contributions and/or expenditures were to the judge’s opponent in the same race – a rather unlikely and self-defeating scenario). 5. Does the amount at issue in the case matter? It could. What if this case were an employment dispute with only $10,000 at stake? It could, if the case was so patently miniscule to the supporter as not to risk offending him/her/it no matter what the disposition. If the question is cast toward the other side’s perspective, however, the amount in dispute is irrelevant—every litigant is entitled to a fair trial before a fair judge. What if the plaintiffs only sought non-monetary relief such as an injunction or declaratory judgment? No, the form of relief sought is generally irrelevant. 6. Does the analysis change depending on whether the judge whose disqualification is sought sits on a trial court, appeals court, or state supreme court? No. 7. How long does the probability of bias last? So long as support matters to holding the office and so long as a strong debt of gratitude lasts. Does the probability of bias diminish over time as the election recedes? Probably, but it depends primarily on his next question: Does it matter whether the judge plans to run for reelection? Yes. 8. What if the “disproportionately” large expenditure is made by an industry association, trade union, physicians’ group, or the plaintiffs’ bar? Same analysis as above. Must the judge recuse in all cases that affect the association’s interests? Surely yes with respect to the pending case, but perhaps yes with respect to (unspecified) others as well. Must the judge recuse in all cases in which a party or lawyer is a member of that group? Not all, but the question does not allow for anything beyond speculation. Does it matter how much the litigant contributed to the association? Yes, it matters. 9. What if the case involves a social or ideological issue rather than a financial one? Must a judge recuse from cases involving, say, abortion rights if he has received “disproportionate” support from individuals who feel strongly about either side of that issue? Is the “support” financial? If yes, then yes. If the supporter wants to help elect judges who are “tough on crime,” must the judge recuse in all criminal cases? Of course, we need to know whether the supporter had a particular case pending in which she had a multi-million dollar interest. If not, then generally no, recusal would not be required in all criminal cases, although an argument can be advanced forcefully that the Constitution is violated when you combine judicial elections with criminal cases, particularly in situations in which the judge’s influential supporters demand toughness on crime and would withhold support in its absence. 10. What if the candidate draws “disproportionate” support from a particular racial, religious, ethnic, or other group, and the case involves an issue of particular importance to that group? This question is void for vagueness. 11. What if the supporter is not a party to the pending or imminent case, but his interests will be affected by the decision? Does the Court’s analysis apply if the supporter “chooses the judge” not in his case, but in someone else’s? If the judge would probably be concerned about the effect of the pending case on his supporter (or the supporter would probably be concerned about the judge’s fidelity), then probably yes. 12. What if the case implicates a regulatory issue that is of great importance to the party making the expenditures, even though he has no direct financial interest in the outcome (e.g., a facial challenge to an agency rulemaking or a suit seeking to limit an agency’s jurisdiction)? The parenthetical example seems contradictory – there certainly could be a strong financial interest motivating the facial challenge. But assuming there is not, we would be dealing with more attenuated corrupting forces. 13. Must the judge’s vote be outcome determinative in order for his non-recusal to constitute a due process violation? No. 14. Does the due process analysis consider the underlying merits of the suit? Does it matter whether the decision is clearly right (or wrong) as a matter of state law? No (although it could be circumstantial evidence of an actually biased judge). 15. What if a lower court decision in favor of the supporter is affirmed on the merits on appeal, by a panel with no “debt of gratitude” to the supporter? Does that “moot” the due process claim? No. Constitutionally unbiased judges are required at every level. 16. What if the judge voted against the supporter in many other cases? Yes, it could matter, as it could show (among other things) no debt of gratitude or expectation of future support. 17. What if the judge disagrees with the supporter’s message or tactics? What if the judge expressly disclaims the support of this person? Yes, that could matter. 18. Should we assume that elected judges feel a “debt of hostility” towards major opponents of their candidacies? Yes, although the term “hostility” is a bit loaded. Must the judge recuse in cases involving individuals or groups who spent large amounts of money trying unsuccessfully to defeat him? Possibly, but the question lacks sufficient circumstances. 19. If there is independent review of a judge’s recusal decision, e.g., by a panel of other judges, does this completely foreclose a due process claim? Although independent review should be the procedure adopted for all, or virtually all, motions to disqualify, the commendable procedure does not eliminate the due process inquiry. For example, these “independent” judges could be members of the same court and thus hesitant to disqualify their colleague, friend, and neighbor. On a more basic level, a state procedure cannot trump the Constitution. 20. Does a debt of gratitude for endorsements by newspapers, interest groups, politicians, or celebrities also give rise to a constitutionally unacceptable probability of bias? They could. How would we measure whether such support is disproportionate? Same or similar methods and tests. 21. Does close personal friendship between a judge and a party or lawyer now give rise to a probability of bias? Arguably yes, and as a practical matter, it always has (although it should be noted that many good judges bend over backwards to avoid actual bias in such cases). 22. Does it matter whether the campaign expenditures come from a party or the party’s attorney? Yes, if the latter, the influences are more attenuated. If from a lawyer, must the judge recuse in every case involving that attorney? If the attorney is to the judge as Blankenship was to Justice Benjamin, then yes. 23. Does what is unconstitutional vary from State to State? Never. What if particular States have a history of expensive judicial elections? Whether and in what form the state holds judicial elections matter, but their overall expensiveness likely would not matter. The test would be the same, just with fewer zeros after the applicable numbers. 24. Under the majority’s “objective” test, do we analyze the due process issue through the lens of a reasonable person, a reasonable lawyer, or a reasonable judge? This is perhaps the first “good” question. In the case, however, all three actors would come to the same conclusion—recusal. As a general matter and as a matter of substantive recusal law, the actor probably should be the reasonable judge. 25. What role does causation play in this analysis? The Court sends conflicting signals on this point. The majority asserts that “[w]hether Blankenship’s campaign contributions were a necessary and sufficient cause of Benjamin’s victory is not the proper inquiry.” But elsewhere in the opinion, the majority considers “the apparent effect such contribution had on the outcome of the election,” ante, at 14, and whether the litigant has been able to “choos[e] the judge in his own cause,” ante, at 16. Yes, causation matters, but it need not be the sole, isolated cause of victory. If causation is a pertinent factor, how do we know whether the contribution or expenditure had any effect on the outcome of the election? It should not be terribly difficult—election success has been analyzed (often correctly) for a long time. Moreover, as the majority noted, the task becomes easier once we acknowledge that we are dealing with probabilities, not actualities. What if the judge won in a landslide? Yes, that matters. What if the judge won primarily because of his opponent’s missteps? Yes, that matters as well. 26. Is the due process analysis less probing for incumbent judges—who typically have a great advantage in elections—than for challengers? No, it is not less probing, but such a “great advantage” should be considered wherever actually applicable. 27. How final must the pending case be with respect to the contributor’s interest? What if, for example, the only issue on appeal is whether the court should certify a class of plaintiffs? Is recusal required just as if the issue in the pending case were ultimate liability? Absolutely. 28. Which cases are implicated by this doctrine? Must the case be pending at the time of the election? No, it must be reasonably likely to be brought. Reasonably likely to be brought? What about an important but unanticipated case filed shortly after the election? If it is truly “unanticipated,” then the litigant certainly did not “choose” the judge in her own case. This fact alone, however, would not be dispositive. 29. When do we impute a probability of bias from one party to another? Does a contribution from a corporation get imputed to its executives, and vice-versa? By casting the legal fictions aside, the answer will become clear or clearer. And obviously, in light of the Court’s holding, imputation can occur from a chief executive to the corporation. Does a contribution or expenditure by one family member get imputed to other family members? Probably, but not necessarily. 30. What if the election is nonpartisan? It could matter, but without facts, it is unclear. What if the election is just a yes-or-no vote about whether to retain an incumbent? For anyone familiar with retention elections, this fact definitely matters. For one, almost all judges up for retention are retained. Moreover, it is much harder to “choose” your judge (save your one vote) at the retention election stage – it is much easier (but still difficult) to oust a judge. 31. What type of support is disqualifying? What if the supporter’s expenditures are used to fund voter registration or get-out-the-vote efforts rather than television advertisements? This twist could matter. Among other factors, one would need to look at the causal link between these activities and electoral success and the expectation of future support. 32. Are contributions or expenditures in connection with a primary aggregated with those in the general election? Yes. What if the contributor supported a different candidate in the primary? Does that dilute the debt of gratitude? Perhaps slightly. 33. What procedures must be followed to challenge a state judge’s failure to recuse? May Caperton claims only be raised on direct review? A strong candidate for an interlocutory appeal exception. Or may such claims also be brought in federal district court under 42 U. S. C. §1983, which allows a person deprived of a federal right by a state official to sue for damages? Perhaps, but it seems unlikely that pecuniary “damages” would be permitted. If §1983 claims are available, who are the proper defendants? The judge? Yes. The whole court? Probably not. The clerk of court? Probably not. 34. What about state-court cases that are already closed? Can the losing parties in those cases now seek collateral relief in federal district court under §1983? Perhaps. What statutes of limitation should be applied to such suits? The “statute of limitations” should not be an immediate issue—as Tuesday would have been the first day on which it should start to run. 35. What is the proper remedy? After a successful Caperton motion, must the parties start from scratch before the lower courts? Yes (unless the now-disqualified judge sat at the appellate level). Is any part of the lower court judgment retained? No. 36. Does a litigant waive his due process claim if he waits until after decision to raise it? Probably (particularly in this instance—when the constitutional-rights waiver is not inadvertent, but instead a tactical decision that could lead to, among other things, wasted judicial proceedings). Or would the claim only be ripe after decision, when the judge’s actions or vote suggest a probability of bias? No. 37. Are the parties entitled to discovery with respect to the judge’s recusal decision? They should be so entitled at least with respect to facially meritorious claims. 39. Does the judge get to respond to the allegation that he is probably biased, or is his reputation solely in the hands of the parties to the case? The judge gets to respond in his ruling on the disqualification motion (or sua sponte in his recusal ruling). 40. What if the parties settle a Caperton claim as part of a broader settlement of the case? Does that leave the judge with no way to salvage his reputation? Once the case is no longer pending, the judge could speak about the merits of the Caperton claim. The concern misses the mark a bit: One of the reasons these “perception”- or “appearance”-based tests have arisen is to avoid the ugly impact of implying, calling, and proving the judge actually biased. The Caperton-disqualified judge can still say – as has Justice Benjamin following the Supreme Court’s decision – that he was not actually biased. Obviously, the answers above are not gospel, and by comment or otherwise, other answers are encouraged. Supreme Court Hears Oral Argument in Caperton v. A.T. Massey Coal Co. The most important potential significance of White is the strong suggestion in the opinions of Justices O’Connor and Ginsburg (writing for a total of five justices) that no judge subject to reelection can decide a controversial case without violating due process. As discussed earlier in this chapter [9: “The Impartial Judge”], due process is denied if there is a “possible temptation to the average . . . judge . . . which might lead him not to hold the balance nice, clear, and true. . . .” There is substantial reason to believe that elective judges are influenced in controversial cases by the threat of being voted out of office. Particularly in a case involving issues like the death penalty or abortion rights, therefore, there is a strong argument that a decision by such a judge violates the Due Process Clause of the Fourteenth Amendment. O’Connor refers to a law review article that quotes former California Supreme Court Justice Otto Kaus’ statement that ignoring the political consequences of controversial cases is like “ignoring a crocodile in your bathtub.” She also relies on an article that cites statistics indicating that judges who face elections are far more likely to override jury sentences of life without parole and impose the death penalty. When lawyers and litigants appear to be buying influence with campaign contributions, the appearance of partiality goes beyond the highly publicized case, tainting any case in which money may have passed. Thus, O’Connor’s ultimate due process challenge is to the entire system of judicial election of judges, in cases of both major and minor public interest. Because states can no longer prevent judicial candidates from announcing views on legal and political issues, some states will very likely abandon judicial elections. To the extent that they do not, a litigant in a case involving a controversial issue will have a strong argument that due process requires disqualification of any judge who is subject to reelection.